_MAL6300, originally uploaded by Michael A. Lowry. For dinner today I had one of my favorite meals: Nürnburger bratwurst with mashed potatoes and sauerkraut. 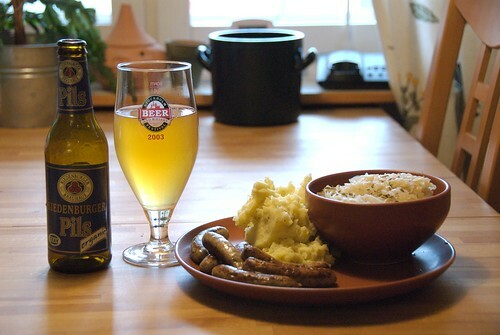 This time I also had a special treat: a bottle of organic Riedenburger Pils beer. Riedenburg is a small town in Bavaria near Regensburg, and it's my good friend Andrea's hometown.